Lesser Celandine (Ranunculus ficaria = Ficaria verna) plants are starting to rise in southern Ohio. This non-native is known as a "spring ephemeral" owing to the time of year when the short-lived plants and flowers are present. The majority of this weed's hide-and-seek life-cycle is spent hidden from view as underground tubers. The tubers provide energy that drives the weed's brief appearance above-ground in the spring. Shoots may begin to rise as early as mid-to-late January in southern Ohio depending on environmental conditions. However, their growth has been delayed a bit this year owing to the almost continual below average winter temperatures. This non-native invasive belongs to the buttercup family, Ranunculaceae, and is sometimes called "fig buttercup." The "fig" refers to the shape of the underground tubers and "buttercup" describes the flowers. Lesser celandine is native to Europe, northern Africa, western Asia, and Siberia. It is believed to have been first introduced to North America as an ornamental in the mid-1800s and escapes were reported in Pennsylvania in 1867. The ground-hugging succulent, shiny dark green kidney or heart-shaped leaves are borne on fleshy, white, tightly clustered leaf stalks. Profuse glossy, butter-yellow flowers that are about 1" in diameter rise singly on stalks slightly above the foliage. The overall effect of a massive colony of lesser celandine is a magical-looking dark green carpet speckled with flecks of bright yellow. It is beautiful unless you consider that the magic carpet rolls over native spring wildflowers. Although lesser celandine plants seldom rise more than 4 – 5" above the soil, they have dense root systems and plants grow together to form mat-like impenetrable canopies. I've observed lesser celandine rolling over Trillium (Trillium spp. ), mayapple (Podophyllum peltatum), cutleaf toothwort (Cardamine concatenate), Dutchman's breeches (Dicentra cucullaria) and Virginia springbeauty (Claytonia virginica). 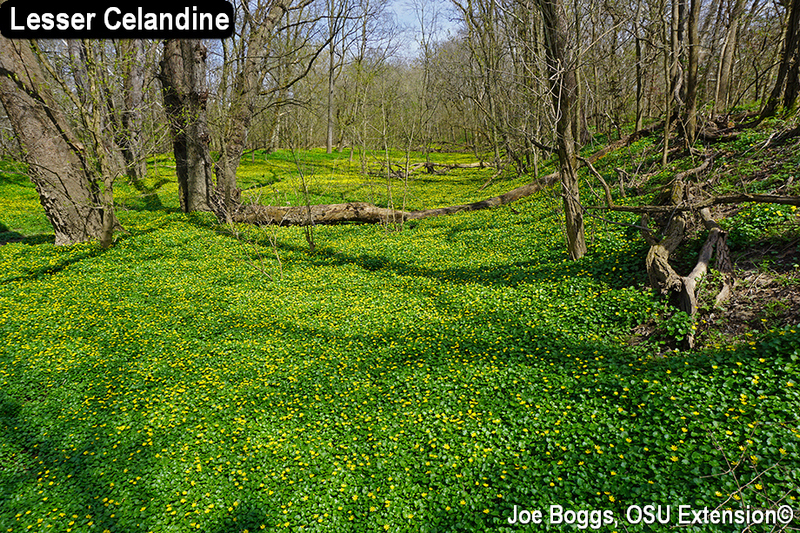 For this reason, lesser celandine appears on the Ohio Department of Agriculture's List of Invasive Plants. Plants on the list are prohibited from being sold or distributed in Ohio. Take care not to confuse our native Marsh Marigold (Caltha palustris) with lesser celandine. Both are spring ephemerals that belong to the buttercup family with plants sporting similar-looking yellow flowers. However, lesser celandine flowers have 3 green sepals and 7–12 yellow to faded yellow petals. Marsh marigold flowers have 5–9 yellow petal-like sepals. Marsh marigold leaves are also much larger and plants lack underground tubers and above ground bulbils. Of course, as its common name implies, marsh marigold does not wander far from wet environs. Lesser celandine has three effective secret weapons for survival and spread. The first is a stockpile of underground tubers produced in the spring that are used to store carbohydrate shipped down from the leaves during their brief spring appearance. The energy cycle reverses the following spring with the tubers supporting new leaf growth. Of course, the tubers can also serve as a foundation for new infestations if they are moved around in contaminated soil. A close examination of leaf axils near the base of mature plants later this spring will reveal the second secret weapon: peculiar looking football-shaped protuberances called bulbils. Bulbils can give rise to new plants and are perfectly suited for being picked-up in the dew claws of deer. Indeed, deer are a major mover of lesser celandine and play a pivotal role in carrying this invasive plant to new locations. Lesser celandine's final secret weapon is its extreme ephemeral nature. Plants collapse and disappear from view in late-spring to early-summer depending on environmental conditions. It's amazing how rapidly a broad expanse of lesser celandine can completely vanish. However, the weed is not gone; it's just biding its time in the form of recharged tubers that will support ever-expanding colonies next season. Given the environmentally disastrous consequences of allowing lesser celandine to spread unchecked, this non-native invasive weed should be eradicated as soon as you spot it. Management becomes more problematic once it becomes widely established. Recommendations for eliminating small colonies includes digging and destroying plants along with the tubers. However, based on my own observations and reports I've heard from frustrated landscape managers and gardeners, this effort usually morphs into an ongoing game of whack-a-mole. It can be very difficult to remove all of the tubers from the soil. Herbicides targeting the spring foliage is the most effective way to prevent more lesser celandine. Colonies in southern Ohio are currently looking like a dense collection of ground-hugging leaves. The new leaves are noticeably mottled with light and dark green patches. Of course, digging up a few plants will reveal the tubers that are supporting new growth. Many of the selective post-emergent herbicides labeled for use on turfgrass are highly effective against lesser celandine that has crept into lawns. These include MCPA, dicamba, and triclopyr. Keep in mind that established colonies are supported by huge numbers of underground tubers which requires multiple applications over a number of years to finally exhaust their energy input. The same is true for managing lesser celandine in landscapes and wooded areas. The larger the infestation, the longer it will take to wipe-out this stubborn weed. The non-selective herbicide glyphosate (e.g. Roundup) is an effective choice given its ability to translocate from the targeted leaves to affect the tubers. Research conducted in Wolf Trap National Park in Virginia and published in 2017 focused on glyphosate applications made in the spring at three early phenological phases: pre-flowering, early flowering, and 50% flowering. The results revealed that a single-season application made at the pre-flowering stage produced 60% control; a second-year application could not be made owing to environmental conditions. Treatments made 2 years in a row targeting the early flowering and 50% flowering stages produced 90% and 95% control, respectively. Anecdotally, landscapers have also had success with pelargonic acid (e.g. Scythe). Although this non-selective contact herbicide does not translocate, it may have a lower impact on preferred plants. Landscapers using the highest labeled rate have had some success and combination products containing glyphosate plus pelargonic acid or glyphosate plus diquat have also been used effectively. Multiple applications made per year, starting before plants flower, and continued over multiple years are required.